Dykema, a leading national law firm, is proud to announce that Justice Phylis J. Speedlin and Dan G. Webster, were each honored by the San Antonio Business Journal with Lifetime Achievement Awards at its 2017 Outstanding Lawyers Awards reception. 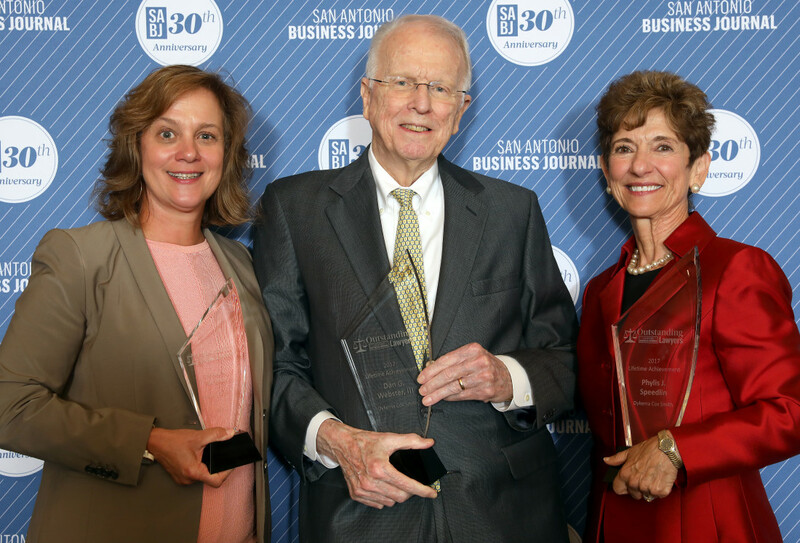 Donna J. McElroy was also present at the Awards ceremony, as she also received one of San Antonio Business Journal’s 2017 Outstanding Lawyers Awards. According to the San Antonio Business Journal, its Outstanding Lawyer Awards recognize lawyers for their professional accomplishments, their impact on the legal industry (locally, statewide and nationwide), leadership within their organization and their impact on the community overall. Having two Lifetime Achievement Award winners in a single year is very rare, as that distinction is not always given on an annual basis. Justice Speedlin is senior counsel in the Firm’s Litigation Department. She counsels clients in two primary areas: alternative dispute resolution—including arbitration, mediation and private judging—and appellate strategy. An attorney for more than 32 years, Justice Speedlin served as a jurist for 13 years, as a justice on the Texas Fourth Court of Appeals for 10 years, and as a Bexar County trial judge for three years. During her tenure on the Fourth Court, she authored more than 1,300 opinions covering a wide variety of issues. To see her awards profile, click here. Dan Webster, who served as managing director of Cox Smith for nearly a decade, is senior counsel in the firm’s Corporate Finance practice group. He serves as the external general counsel for a number of San Antonio companies, advising clients on general corporate and securities matters, corporate finance, venture capital, and mergers and acquisitions. He also previously served as head of Cox Smith’s Healthcare / Life Sciences practice. To see his awards profile, click here. McElroy, a trial lawyer, is former leader of Dykema Cox Smith’s Labor & Employment Department and was the first woman to serve on Cox Smith’s Management Advisory Committee. In addition to her litigation practice, she works with the clients to develop effective EEO and NLRB policies, designs noncompetition and non-solicitation agreements and troubleshoots day-to-day employer concerns – including dealing with social media and its growing impact on the work place. Throughout her more than three-decade career, McElroy has represented employers before juries, judges, arbitration panels and in administrative proceedings. To see her awards profile, click here.